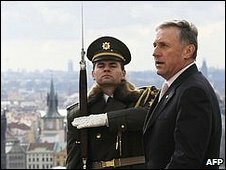 The Czech government has withdrawn treaties committing the country to the US' missile defence shield from parliament, fearing they faced defeat. The scheme is very controversial and the centre-right government has only a slim majority in parliament, which was due to vote on the treaties on Tuesday. Prime Minister Mirek Topolanek insisted the withdrawal was temporary. But doubts hang over the whole project, with US President Barack Obama refusing to commit to it. The Czech government has invested much political capital in the project, which would rely on a radar station based on Czech soil. The opposition is against Czech participation in the scheme. With one MP sick, and another recovering from a car accident, the government beat a tactical retreat, says the BBC's correspondent in Prague. "This does not mean we are giving up on the ratification process," Mr Topolanek said. "We can return this material to the lower house at any time." The treaties have already passed the Senate, but must also pass the lower house to take effect. Mr Topolanek is likely to discuss the matter with Mr Obama when he visits Prague next month. Mr Obama has said his support for the missile shield - conceived under his predecessor George W Bush - depends on its affordability and proof that the technology works. He has also said there would be no need for the shield if Iran was prevented from obtaining nuclear arms. Some analysts have read this as an offer to Russia - which deeply opposes the project - to drop the shield plans if Moscow takes a harder line with Iran.